Cooking the pork goes so well in the pressure cooker. Great recipe! This is so tender and juicy!! Love making it in the pressure cooker, so good. This is so easy to make and tastes like it cooked all day! Thanks for sharing! 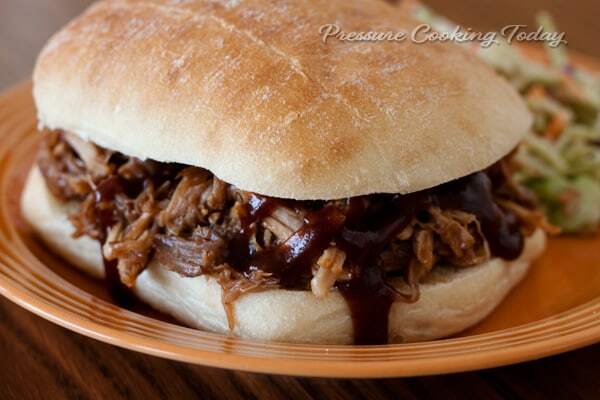 I was going to make my usual pulled pork recipe in the oven, but your version is just as delicious and so much faster!! Hi. I saw that someone else had a question about increasing the amount of meat. I want to see if I can double this in my 6-quart IP. I making this for a crowd! In addition to cutting the meat into 2-pound portions and keeping the same cook time, I assume I would double the water and sauce, correct? Sorry if that’s a stupid question! Have you doubled this before? I wonder how many mini sliders I can get out of 8 pounds of this shredded pork? I’m using those little Hawaiian rolls. Hi Jennifer – no need to double the water and sauce, the pork will release a lot of liquid as it cooks. I have not doubled it before. Just don’t fill the pot more than 2/3’s full because you need room for the steam. It makes 8 servings, so I think you’d get about 24 Hawaiian roll servings without doubling it. Although its been almost a year since the last comment was posted…your recipe for the pulled pork is still out of this world! Of course along with your help was that of the two packages of pork I bought were mispriced at .01/lbs! YES!!! It ran me $0.04 for both packages! So between your recipe and the sweet deal…dinner was outrageous! Thanks again! Stephanie from Phx! Wow now that’s a bargain! So glad it was a hit – thanks Stephanie. 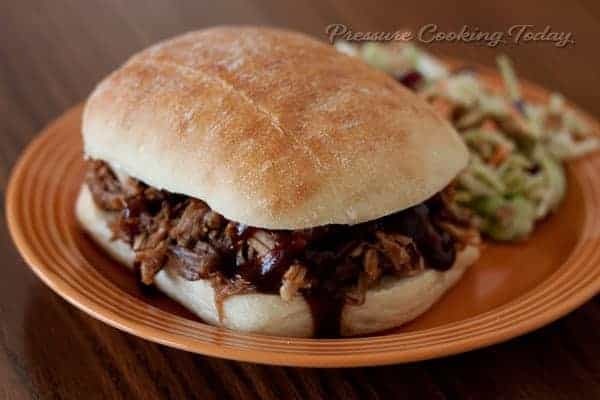 I was going to make pulled pork in my slow cooker, then thought to make in my Instant Pot. I am so glad I found your recipe, it was so easy and good. Never will buy premade again and always will make in Pot. Thank you so much. Serving to the Amish craftsmen building our garage. Thanks Marilyn – glad you found my recipe too. It’s the perfect way to feed a crowd. Good luck with the garage. Did you leave the extra fat layer on the pork shoulder? If you left the fat layer on in your recipe, is there anything I could do to make up for the absence of the fat layer I tossed? Like could/should I add oil or maybe even bacon? If so, what should I add and at what step? 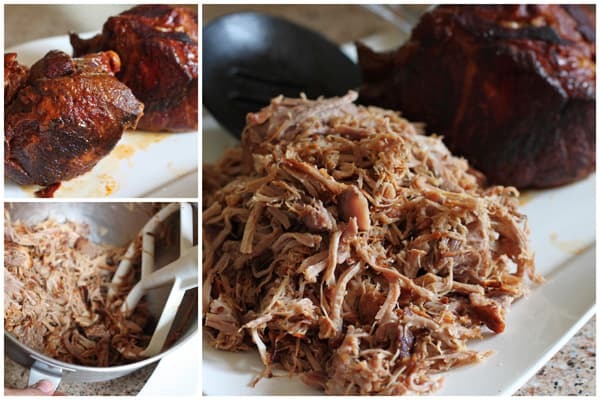 Hi Elaine – Pork shoulder typically has enough fat / marbling in the meat that you should be fine to cook the recipe as described without making any changes. Enjoy! It’s so refreshing to find a recipe that doesn’t call for 8 million spices I’m most likely to not have in my kitchen. BBQ sauce and water! That’s all you need to make this delicious! Just threw in about 6lb of meat. T’was bone-in but I cut the bone out and put it in separately. Hoping 75 min will be enough. Thanks! Sounds like it will be delicious. If 75 minutes doesn’t get you the fall apart tender pork you’d like, just lock the lid and cook it a little longer. As much as i would love to use BBQ sauce, there is a dieter in the house that cannot have any. Do i need to add more water when i cook it then? 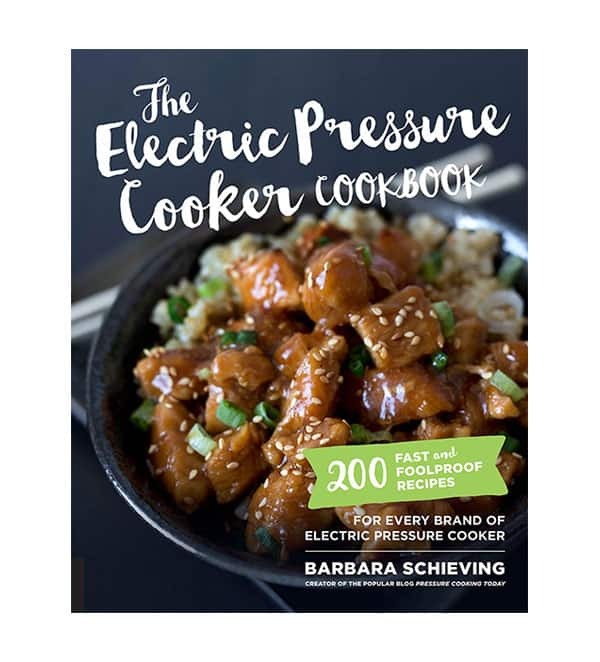 Hi Cooper – if you have a 6 quart electric pressure cooker 1/2 cup water will be enough. You could add some spices and a little bit of liquid smoke to the water. 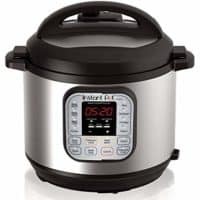 I noticed that the cook time for your Pulled Pork recipe in your pressurecookingtoday website states 75 minutes high pressure and the recipe on your Electric Pressure Cooker Cookbook states 60 minutes. I used 60 minutes on a 3 1/2 lb roast and it was successful, but I am wondering if there is something I may have missed. Hi Harold – the recipe in the cookbook I cut the pork roast into 4 equal pieces so the cook time is faster than this recipe where I cut the roast into 2 pieces. Glad you enjoyed the recipe! What size roast should I cook if I’m cooking for three people? A 2 lb. roast should work well for three people with no changes in cook time. Use the same amount of water and reduce the BBQ sauce by half. Enjoy! How long should I cook it if I am using a 3lb roast? Hi Kelly – I would still cut it in half and shave about 5 or ten minutes off the cook time. I tried this recipe as written with 4.8 lb bone in pork shoulder roast and found the time wasn’t long enough time. Only the meat on the outer edges would shred. I ended up putting it back in for another 30 min using the quick release when time was up. Meat shredded much better. Just a heads up for anyone wondering and a lesson learned for me. Bone in needs much longer. Otherwise, it tasted delicious. Thanks for sharing Jan 🙂 Did you cut the pork shoulder into two pieces? 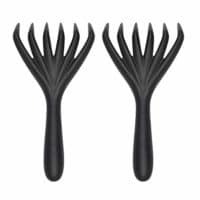 Can I substitute boneless pork ribeye chops? Hi Grant – yes, but your cook time would be reduced. I’d try 25 minutes. Hi Cynthia – I’m not sure I understand the question. Nothing can go between the pressure cooking unit and the pressure cooking inner pot. If you’re wanting to put wood chips in the inner pressure cooking pot with a pot on top of the chips, I guess could, but you would have to use plenty of water to bring the pressure cooker to pressure and you’d have to put the wood chips in a closed container so they didn’t float up and cause problems. But I don’t think you’d get the smokey flavor that you were hoping for. She could try using Liquid Smoke, perhaps in the shredded meat. I used 1/4 tsp in the liquid when cooking some Baby Pork Back Ribs. That would be a good option. Thanks Jack. What if I have 9.5 lbs do I need to increase the cooking time? Hi Henry – cut the pork into 2 lb. sections and your cook time will be the same. 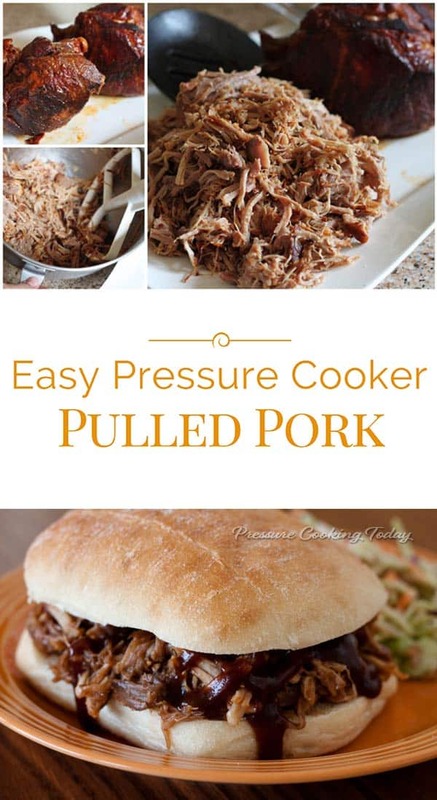 However, you’ll need to have a large pressure cook to accommodate that much pork at one time. Enjoy! Can you make this with a frozen roast? How would cooking time and liquids be adjusted? Yes, you can use a frozen roast. Add 5 minutes per pound and just keep cooking it until it’s as fall apart tender as you’d like. It will take longer to come to pressure as well, so give yourself lots of extra time. I only have a pork loin. Would this work for pulled pork? Hi Lauree – pork loin works in a pinch. It won’t be as succulent but it will shred and be tasty.